The Lowrance Outboard Pilot Cable Steer Pack is an autopilot system designed for boats up to 30ft with a single outboard motor. 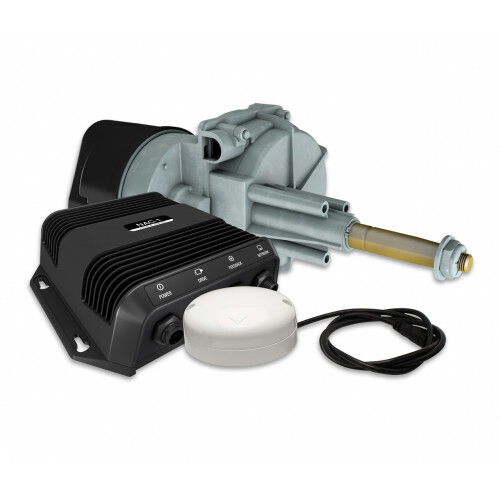 A HDS Autopilot that includes Point-1 Heading and GPS Sensor, NAC-1 Autopilot Computer, HELM-1 cable-steer helm drive unit , Standby-Auto button and Micro-C network components, everything you need to fit an Autopilot to a cable steer outboard motor. Features a brand new user interface built to complement Gen2 and Gen2 Touch multifunction displays and provides easy installation. Other features include dash-mount button for one-touch Auto/Standby activation, steer to heading, course or route and automatic turn patterns, also you can always add an additional Helm station to a boat using the HDS Power steer commands.